Taliesin West in Scottsdale, Arizona is commonly known as the winter home of American architect Frank Lloyd Wright. Not only was it his winter home, it was the school where he taught his fellowship of apprentices. He built a large drafting studio with enough space to accommodate up to thirty architects, including himself. The studio was not only for his student’s studies: during his time here (from age 70 to age 91), Wright created about one half of his life’s work in architecture. Wright’s connection to nature was perhaps in a vein similar to that of the writer Henry David Thoreau. Both were naturalists who lived and created art on the fringe between the urban and rural worlds. Wright never climbed mountains like John Muir, but just as well held the mountains as sacred. Thoreau, Muir, and so many other contributed mightily to the conservation of natural areas, but Frank Lloyd Wright literally brought nature and its benefits right into the homes we live in, often in major cities like Chicago. Other times, he did it on the fringe of nature itself, like at Taliesin West. The view at dusk from Taliesin West’s famous reflecting pool. Well, only nowadays is Taliesin West on the fringe between the natural and man-made worlds. When he bought the plot of land that would become Taliesin West in 1937, the nearest settlement was nearly 15 miles away, across the desolate desert valley. The only man-made lights that were visible across his vista were the campfires of sheepherders. This remote setting allowed for Wright, his family, and his apprentices to foster a connection with nature, and for Wright to more purely practice his own philosophy. Wright’s groundbreaking philosophy was called “organic architecture”, a term he proudly coined. Organic architecture is often described as design influenced by and in harmony with natural environment. It was one of his greatest contributions to modern design. As his apprentices built the walls of Taliesin West, he kept a keen eye to the natural world surrounding them. The Sonoran Desert around them provided the inspiration and the building materials. At the footsteps at the McDowell Mountains, Wright’s 640 acre property provided an unlimited supply of quartzite boulders to build rock walls. The desert washes provided sand to mix the concrete that was to hold these rocks together. In a very literal way, the walls of Taliesin West are in harmony with the natural environment because they are built from the desert landscape itself. Carved in some of the boulders are petroglyphs left by the ancient Hohokam people that inhabited the region 1,000 years ago. Wright loved the petroglyphs and their cryptic designs, and had them placed at various places throughout the property. One petroglyph in particular even inspired Wright to design a logo that would represent his fellowship of apprentices, and is now used to represent the Frank Llloyd Wright Foundation. At Taliesin West, Frank Lloyd Wright fused the rugged and angular desert landscape with modern architecture. To erect the beams that make for Taliesin West’s open interior spaces, Wright was not able to use native materials. The local desert trees do not grow tall enough, wide enough, or straight enough for what was required. Wright forced to buy imported lumber, which he then had to design to be in harmony with the natural environment. He looked to the desert and saw lots of angular shapes. The rugged desert mountains had angular ridges and slopes. The boulders that made up the mountainsides were angular. The palo verde and mesquite trees, with their tiny leaves, showed complex sets of branches that were angular in form. From these angular shapes, he could trace triangles and hexagons. He took triangles, hexagons, and angular forms and incorporated them into the design in almost every aspect. Pools of water are shaped liked triangles and hexagons. Triangles dot the ends of stools of the drafting studio and are swept into rock beams in his theater. Some rooms have hexagon shaped doorways, many chairs have hexagon shaped backs. Almost every ceiling is tilted at an angle, mimicking the steep angles of the mountains above. Not only do the designs harmonize through shape, but also through color. Almost every piece of foreign material is painted red. Not just any red, but a maroon hue that bears a strong resemblance to the red iron oxide in the quartzite boulders. Red also happened to be Frank Lloyd Wright’s favorite color, although he had a strong preference for a orange-red that he called Cherokee Red. While Wright designed his buildings to harmonize with the desert, he instructed his apprentices to do the same. 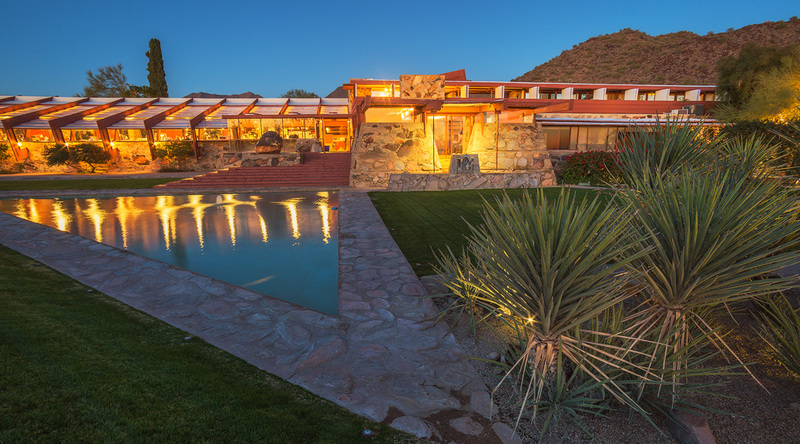 He often referred to Taliesin West as his “winter camp”, and commanded the apprentices to camp out in the desert when they were on site, as part of their training. Wright even slept in a canvas tent right along with the apprentices until his wife Oglivanna insisted on keeping more civilized quarters. Hohokam petroglyphs incorporated into the stone masonry. While the apprentices camped, in itself fostering a connection with nature, Wright encouraged them to experiment with their designing their own “desert shelters”. As they were not provided conveniences such as running water, electricity, or natural gas, the apprentices were forced to look to nature in their designs. Their principle source of light and heat would be the desert sun. Their principle source of materials would be the desert landscape. Wright believed they would be better architects by learning to use what nature gave them – using the sun’s free light and energy to their advantage. The apprentices learned valuable lessons while in the desert as well. More than one decided to place their shelter in the relative privacy of a natural drainage. They soon learned that when it rained, their shelter would flood. Better that they learn this in their own primitive home as a student rather than as a professional architect getting paid by a client to lay out a property. Today, Taliesin West is home to the Frank Lloyd Wright School of Architecture during the winter months. The old drafting studio where Wright and his apprentices worked is now a classroom. The desert landscape where the apprentices once camped is now home to the students. Some choose to live in an apartment on site, but most choose to have the real Frank Lloyd Wright experience and live in a desert shelter. Some move into a shelter previously built by a former student or apprentice. Most take on the challenge of designing and building their own desert shelter to live in during their time as a Master’s level student. “Hanging Shelter”, a desert shelter designed by former students Fatma Elmalimpinar and Fabian Mantel in 2001. Only available for public viewing on Taliesin West’s “Desert Shelter Tour” (information below). Wow! Excellent article and photography, very informative.